Let me introduce you to Baxter. Baxter is an affable, adorable dog living in Shaw. Baxter has an owner named Jonas Singer, both of whom enjoy strolls around the neighborhood and the grassy Le Droit Park. Baxter is also blind. Story has it that one fine day while the two were romping around good ol’ Shaw, Singer had an idea. He and some friends approached Darnell of Darnell’s Bar, located on the quiet corner of 9th St and Florida Avenue, which opened at 5pm. The ingenious idea was to create a pop-up restaurant during the day that would cater to neighborhood residents and foster community, providing breakfast and lunch meals made exclusively from fresh and local produce from the surrounding area and aptly naming it the Blind Dog Cafe. Nestled on a colorfully-clothed bench, one can enjoy good coffee, a better sandwich, and free WiFi (appropriately, the password is BAXTERCANTSEE). On any given day, the place is full of locals grabbing a quick bite, or young professionals typing away on a Mac laptop next to a plate full of crumbs. And per the nomming on a budget blog motif, salads and sandwiches are only $9 and $10 respectively! 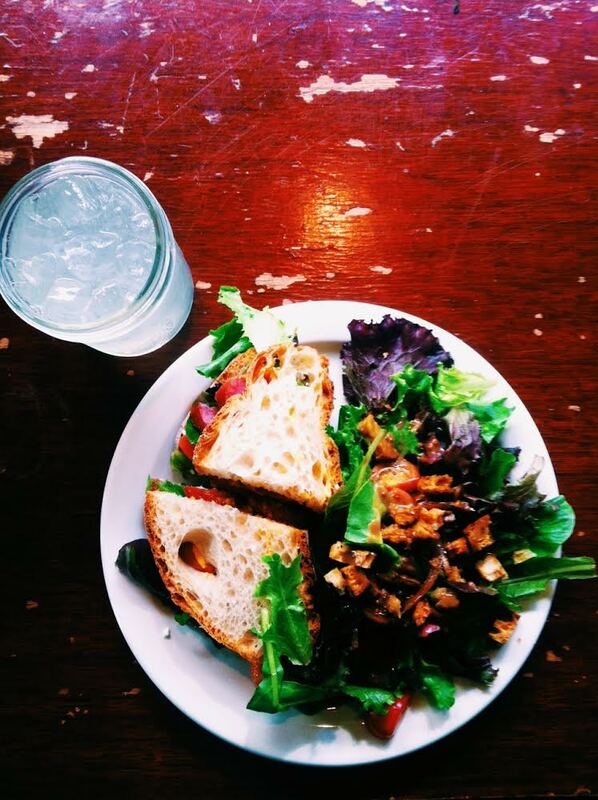 I chose the famed Roasted Chorizo sandwich with a side salad. It boasts chorizo sausage, cherry tomatoes, and an absolutely delectable sriracha aioli. I ate it in five minutes. To wash it all down, I chose one of the in-house sodas in the Lime flavor. I am an enormous fan of effervescent beverages, and this limey delight was no let down. Snag a table this weekend and enjoy! Meager (adjective): deficient in quantity or quality; lacking fullness or richness; scanty; inadequate. No offense to all the canned tuna lovers out there- but by itself, canned tuna is probably as boring as it gets. And it’s smelly. However, I was on a mission to capitalize on my grocery’s cheap cans and make tuna less meager and more mouthwatering. Solution: add in a ton of flavor and toss it in a protein-packed salad. I for one am normally anti-mayo but pro-any other condiment, so I mixed in the tuna with some light mayo and dijon mustard (two to one ration of mustard to mayo) and then added lemon juice and oregano to give the tuna some pizzazz. 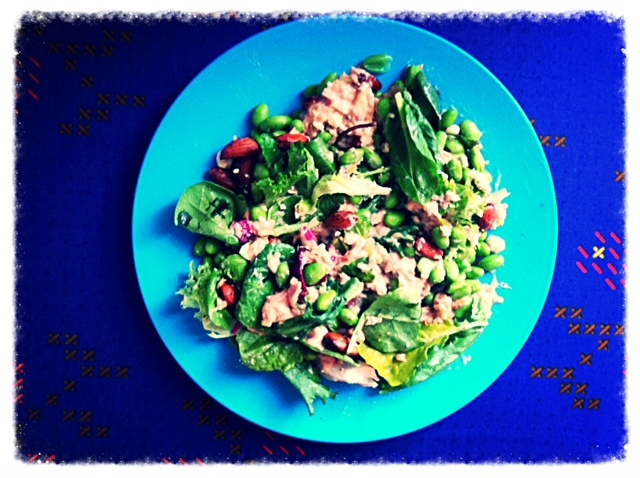 Rummaging in the fridge I found mixed greens, feta, and some leftover edamame to throw together a lunchtime salad. Almonds provided the final protein crunch, and wallah! Super healthy, quick and easy salad to fuel your bod after what (I hope) was a wing and dip-filled football Sunday! Just as with the Dill Salmon recipe, we can all thank my mother (Cynthia, aka Cynbad) for this genius recipe. It’s a surprising, healthy twist on an infamous college staple- ramen noodles. As you will see below, there are a myriad of rando ingredients to buy which definitely add up, especially if you possess none of these already. HOWEVER, this recipe makes 10 cups and lasts for days, becoming increasingly more flavorful. I once made this during finals week and basically nommed on it morning, noon and night for a solid 4 days. 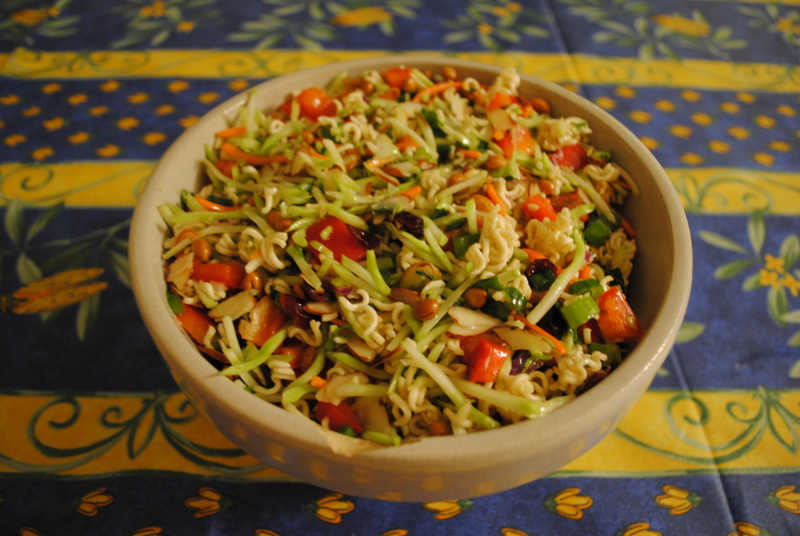 It is also a very easy and delicious contribution for any sort of dinner party or casual gathering. My mom, the consummate hostess, made it every time I wanted to have my gang of friends over; this occurred so often and with such warm reception that my best friend always asks if Ramen Salad is in the fridge before agreeing to make the 6 minute drive. Basically, you can’t go wrong. Crush dry noodles into small-sized bits and mix all ingredients together in large bowl. Combine ingredients in separate bowl and whisk together. Pour dressing into large bowl with Ramen mix and stir until Ramen mix is coated. Let sit for 1 hour before serving so the dressing gets all soaked up and enjoy!! So I just moved to a new townhouse and convinced the parentals to fund the acquisition of a grill for our outside deck. Be warned: I will feature grill recipes well into October. 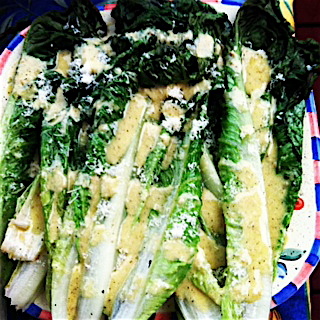 That being said, I have wanted to learn how to grill salad since I had delicious Caesar rendition at Rustico in Ballston, VA. It is SO EASY. and cheap. Duh. -for the dressing: Olive oil, dijon mustard, parmesan cheese ($3 ish), minced garlic, lemon juice. You probably have some of these ingredients laying around already, and you only need a smidge of each. If you have to purchase everything, it’ll be a little less than $10. -heat the grill to Medium flame. 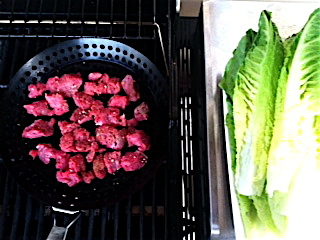 Lightly coat both sides of full romaine leaves and spread out evenly on grill. Grill until start to wilt or start to get grill marks. Flip over for like 30 seconds and remove from grill. -in a blender, combine 1/2 cup olive oil, 1 tbsp dijon mustard, 1 tbsp minced garlic, 1 tbsp lemon juice, and a bunch of freshly grated parmesan cheese. Feel free to alter the ratios; I don’t really believe in measuring. Pulse until blended. -package of Angus Beef steak bites. I purchased mine for $4.99 at Target. Another warning: this meat is not organic, “happy cow”, or anything of the like. I like meat so I buy it and don’t ask many questions. Obviously feel free to splurge on a meat selection of your choice. I chose my package because of the price/quantity factor. -Any grill seasoning, secret personal seasoning, minced garlic, or a combination thereof. -Directions: Grill in a grill-pan on high heat; cook to desired temperature. You’re done. You spent a MAXIMUM of $15. A full package of romaine should feed 2-3 people, and the package of steak bites is actually 3.5 servings. Pat yourself on the back.